Parents flying with kids in business class on Cathay Pacific understandably want to know where to sit. I certainly did before boarding my first long haul flight on the airline as a mother. 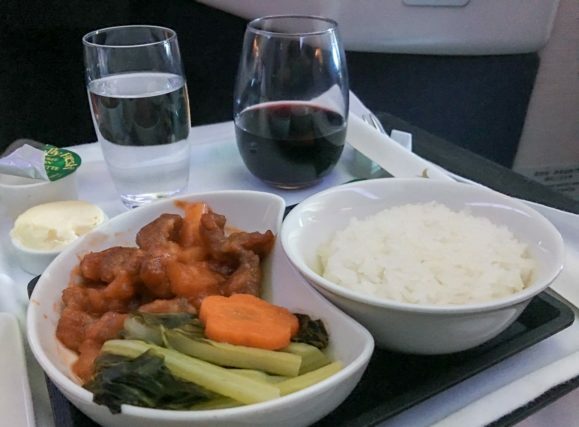 Cathay Pacific (and their regional subsidiary Cathay Dragon) was our primary airline for the five years we lived in Hong Kong and, to this day, I’m constantly waxing on about how fantastic they are from a passenger’s perspective. 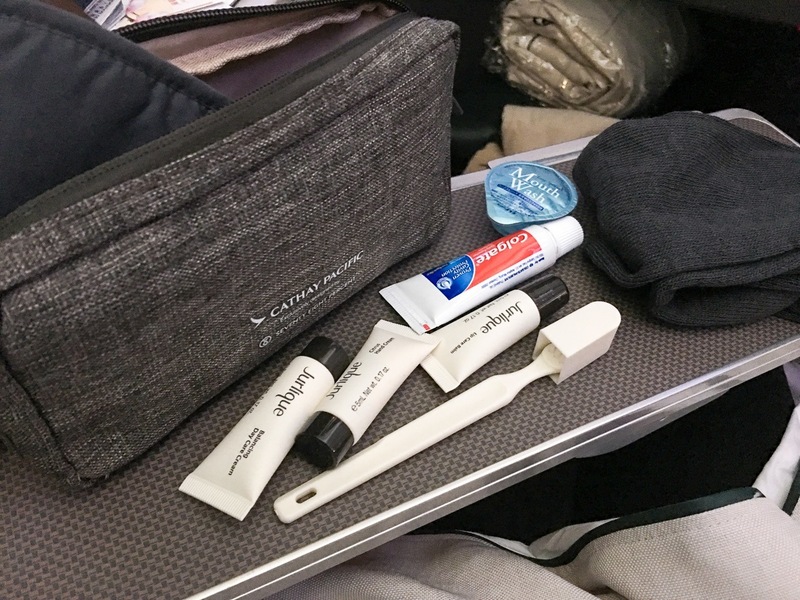 I receive a number of questions regarding the inflight experience in Cathay Pacific business class, so it’s high time to update this post. 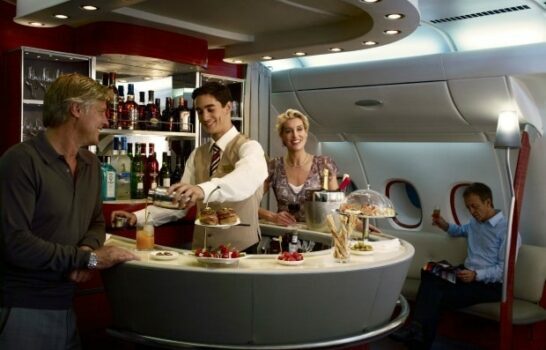 I’ve experienced three versions of their business class (four, if you count their new regional business class). 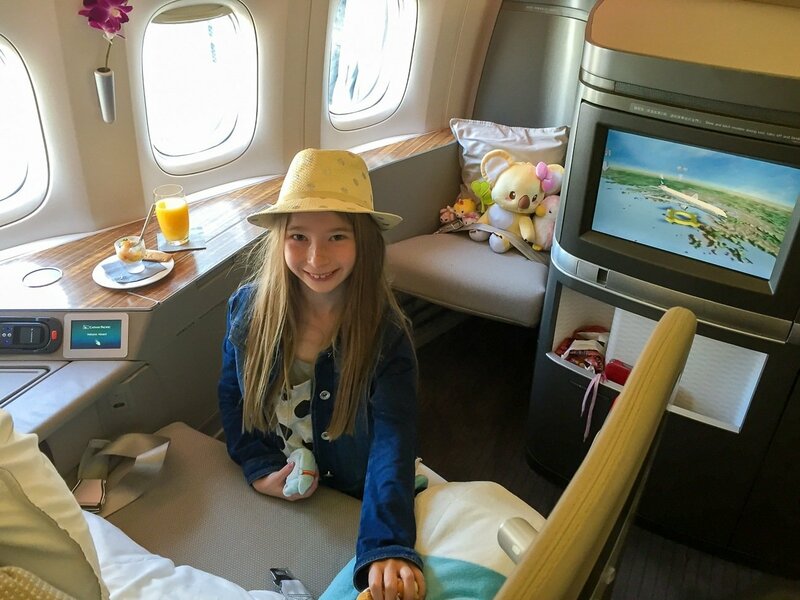 My daughter and I flew the most recent business class configuration a few weeks ago from Los Angeles to Hong Kong and back. 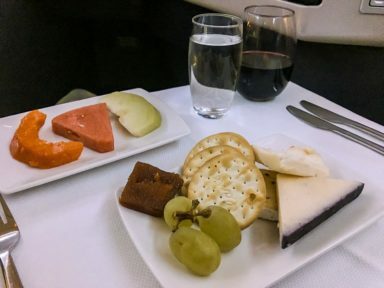 Based on popular demand, this post now features more information about the inflight dining experience in addition to where to sit with kids. It is hard for me to articulate how much I love this airline. They make flying enjoyable and worth every penny (or mile). The current award-winning Cathay Pacific business class has one seat on each window and two in the middle. When flying with kids, you might think that the two middle seats are your best bet and reservations agents might suggest this. The parent who will tend to the child most should sit across the aisle from the child. If I am flying alone with my daughter, it is far better for her to sit on the window side with me across the aisle from her. For example, this would be seat 22K (window) and seat 22G (aisle). The reason is because there is a partition between the middle seats. In order to access your child, you’ll need to walk all the way around the business class cabin to the other aisle in order to assist your child which is is a hassle during drink service, meal service and when the seat belt sign is on. You can step over it, but even at 5’9″ I find doing this uncomfortable and awkward. Now that my daughter is 9 years old, she prefers that we take the middle seats because her line of sight to me is better than if we sit across the aisle from each other. When in the middle seats, we can easily hand each other things over the partition and I can easily help her with homework. If you choose middle seats, your child will board the plane through the aisle opposite to you, which my daughter finds a bit nerve-wracking. Also, kids are unable to put carry-ons into the overhead compartment without help so if we are sitting this way I place her carry-ons in my bin so they are easier to access. Middle seats will be difficult if flying with young kids like a 3-year-old who will need assistance with seat belts, toys and eating so it is wiser to take the window and aisle seat as I’ve suggested above. Being seated across the aisle from her, allows me to quickly duck in and out of her space without disturbing other passengers as much. I can stealthily help her when the seat belt sign is on with dropped toys, snacks and more. The downside is that I can’t see her as well without leaning forward. I still find this arrangement preferable when kids are young. From a lifetime of practice, she’s happy as a clam in her pod and a better flier than a lot of adults—leaving me to drink wine and watch movies in peace. Kids ages 3-6 also receive an amenity kit on some long haul flights that changes with the seasons. It usually has a bag full of activities like puzzles, stickers and coloring. 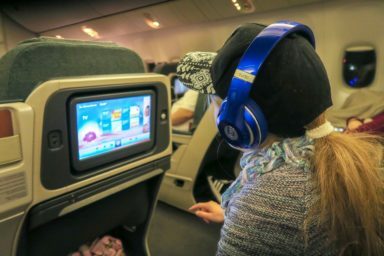 CX Studio, the inflight entertainment system, has video games for older kids and more movies on demand than the younger set can watch on a long haul flight. The Disney Channel is a highlight for my daughter. 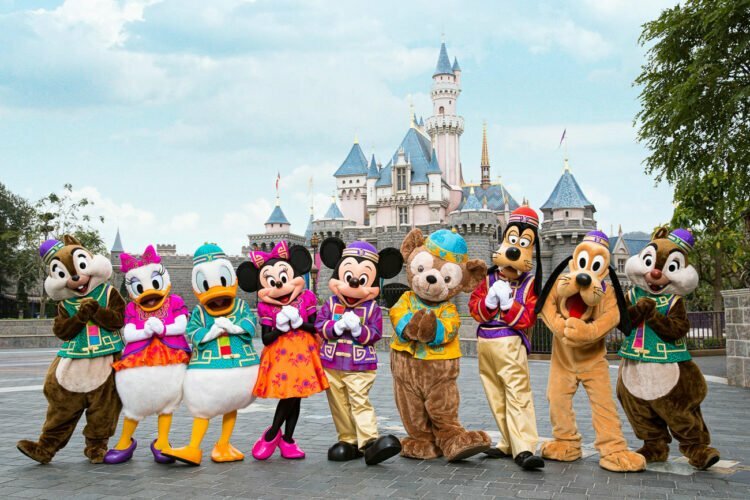 Speaking of Disney, if Hong Kong is your destination, do take the kids to Hong Kong Disneyland. Every seat will have a duvet and sizable pillow as well as a decent amount of storage. 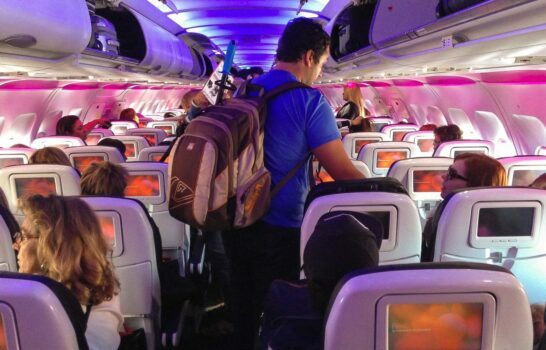 Note that laptops, purses and anything large will need to be stored prior to take-off and landing. I often put smaller items in the shelf area or in the cupboard that holds the sound-proof headphones (though laptops are too large to be stored here). Now that she’s 9, she receives the same amenity kit that I do. Call in advance to reserve your child a kids’ meal which usually has selections like pasta or noodles (geared toward Asian preferences, however) and things like this. When she turned 7, I stopped ordering her the kids meals because she loves Cantonese food so much. There is usually a dim sum option for breakfast or lunch and plenty for her to choose from throughout each meal’s multiple courses. 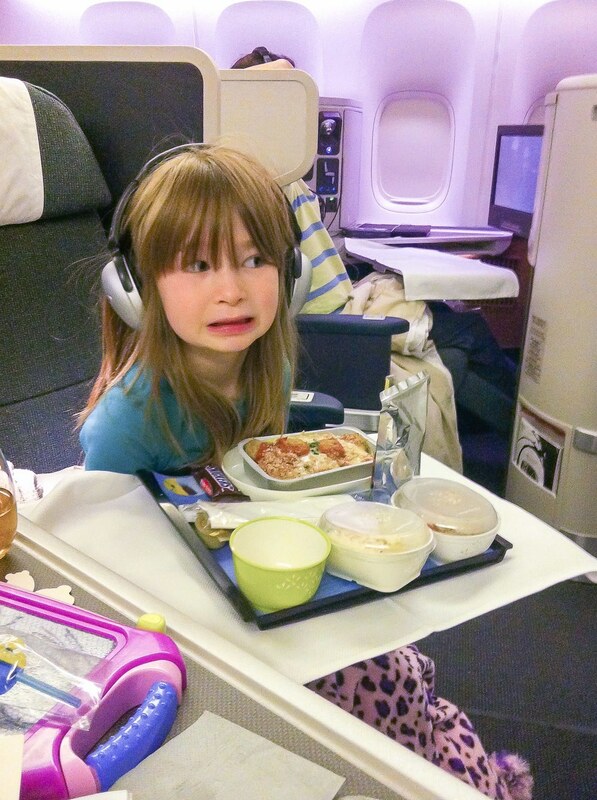 In business class, plenty of kid-friendly rolls, fruit and cheese are passed around for the entire cabin to enjoy. I usually order a different entree just in case she doesn’t care for the one she chooses. Breakfast course includes a choice (and you can choose them all, if you like) fruit, yogurt, cereal followed by a main course and bread basket. 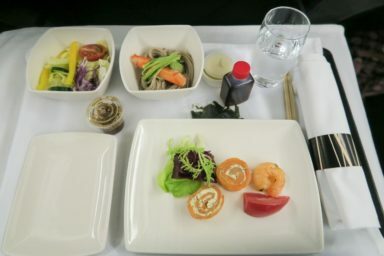 Mid-flight choices include small snacks (Haagen Das cups, too) and larger courses like a burger or noodle soup. Dinner includes a starter course, entree, bread, selection of fruit and cheese as well as a dessert. To give you an idea, this is what our last meal service looked like. The Cathay Delight kiwi smoothie is also a favorite of my daughter’s and served in the Hong Kong lounges and sometimes on board. Cathay Pacific also has baby food available (do call to verify, however) but you are not able to reserve flavors in advance so passengers receive whatever flavors they have. Flight attendants are not allowed to reheat or refrigerate baby food or milk so plan accordingly. The “old” Cathay Pacific business class was introduced around the time my daughter was born, 9 years ago, and still flies on some regional and long haul routes. Like the current business class, these pods are in a herringbone configuration but the seats are slightly offset and designed so that it is a little tougher to fly with kids or socialize with a travel partner. The pods are skinny without lines of sight into other pods, which is great for business travelers though less comfortable for tall people like my husband. These are small complaints for still an awesome flight experience, however. In the photo above, I am sitting in the aisle across from my daughter (my husband is next to her). Instead of booking seats 25A and 25D, you can see much better into your child’s pod if you stagger your seats so that the window seat is slightly behind you. So, my daughter would sit in seat 26A against the window and I would take the aisle seat in row 25D. 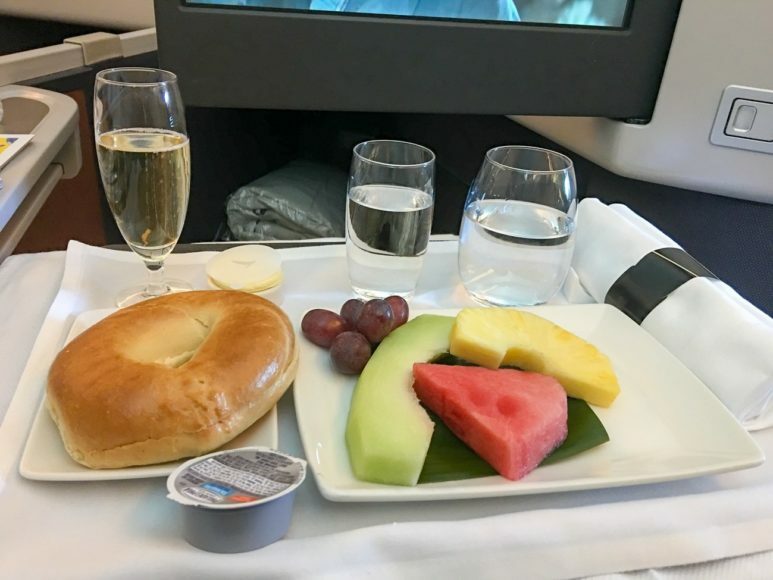 Reservation agents know what type of business class is featured on your flight, but keep in mind that is always subject to change in the rare instance that they switch planes. I also check SeatGuru.com which tends to be accurate most of the time. I believe this configuration has been fully phased out though I have flown it within the last few years. The new regional business class has side-by-side seating so just reserve your child a seat next to you and you’ll be fine. There is ample legroom, the same expansive movie and TV selections and more-or-less the same dining with starters, entree (forgot to take a photo last time), cheese selection and desserts. 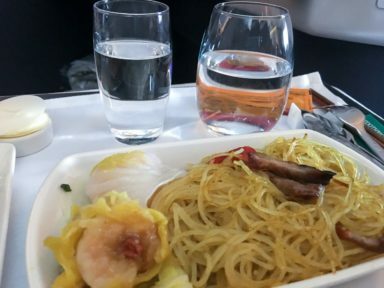 I do wish the longer routes like Tokyo – Hong Kong still had the lie-flat business class (some still do so check with reservations) but this seems to be the way many airlines are headed. If you plan to bring a car seat to use onboard, you must make sure that it’s permitted in the class of service. The CARES harness can be used in economy class and premium economy class but does not work in business class or first class seats. Instead, Cathay Pacific has a belt that will attach to yours so that you can hold your child on your lap during takeoff and landing. We used this restraint until my daughter was 3, I believe. Cathay Pacific does have bassinets available in business class at the bulkhead. Make sure these seats are available before booking as many families fly business class to and from Hong Kong. 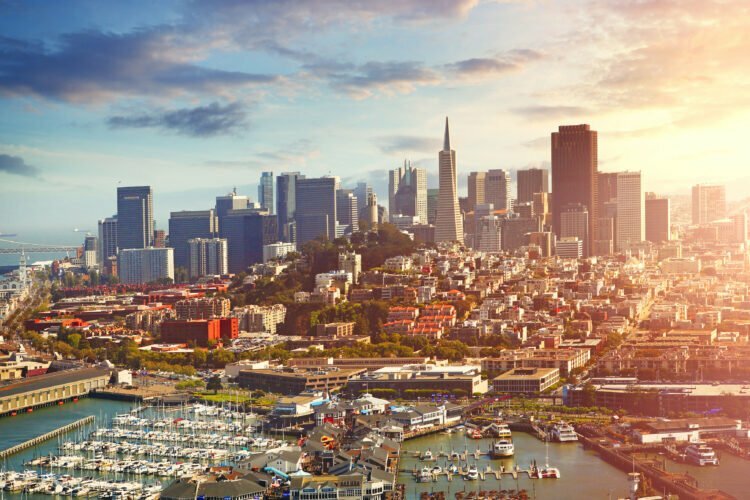 Discounted business class tickets are hard to find unless there is a Cathay Pacific sale. I find that I am most often alerted to airfare sales through the Cathay Pacific Facebook page. I can access business class fares originating in the U.S. or Canada at a wholesale discount (it’s apparently the same service used by Maroon 5 and other large corporations) through Regal Wings. 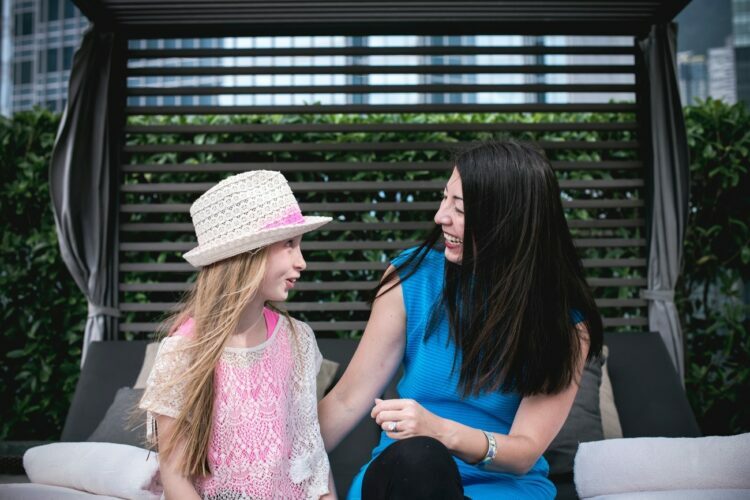 If the opportunity arises, while business class on Cathay Pacific with kids is awesome, first class is a bucket list experience to take advantage of. 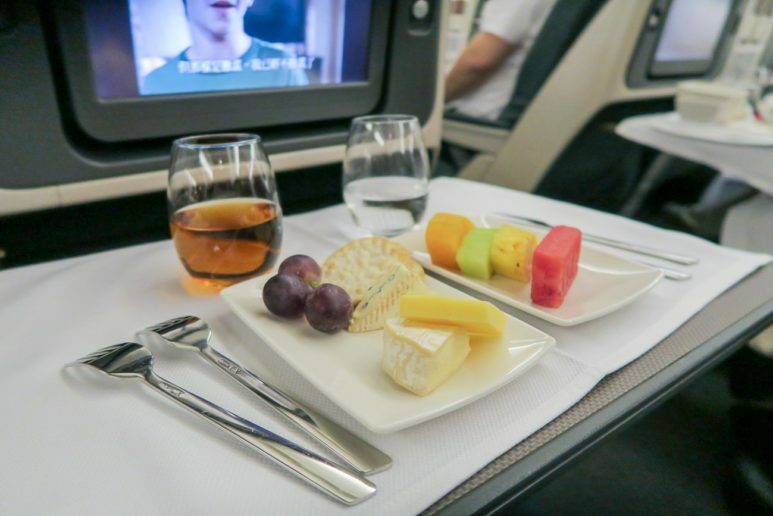 Read about our recent experience in first class on Cathay Pacific. I haven’t yet received sub-par service on a Cathay Pacific flight. I would guess we’ve flown well over a hundred flights on the airline in the last 12 years. I often flew long haul alone when my daughter was a baby and the flight attendants were incredibly helpful with my bags, warming up her food and more. They were never cranky or rude and, to give you an example, one of the flight attendants on our last flight roamed the cabin and introduced himself by name. His demeanor was fantastic with my often-shy daughter. When we were more regular fliers, some began to recognize my daughter and I remembered which chocolates out of the after-dinner box we liked. I only remember one flight that was delayed more than a half an hour, otherwise most take off when promised though recent air traffic control issues on mainland China mean these flights can be delayed. The lounges at Hong Kong International Airport (Chek Lap Kok) are also top of the line. 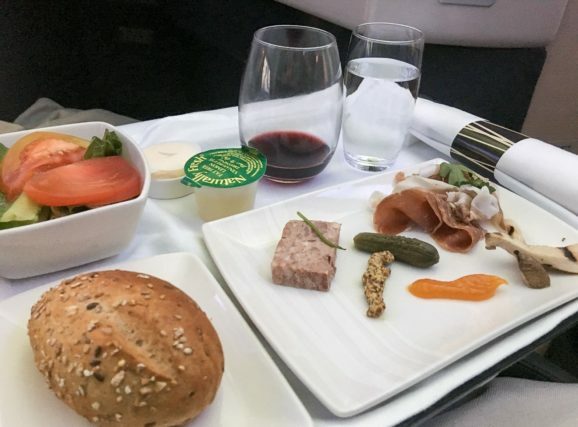 The wine and food on board in any class is excellent for an airline. I could go on and on. See my article about jet lag and kids for advice regarding how to handle the first few days after a long haul flight. 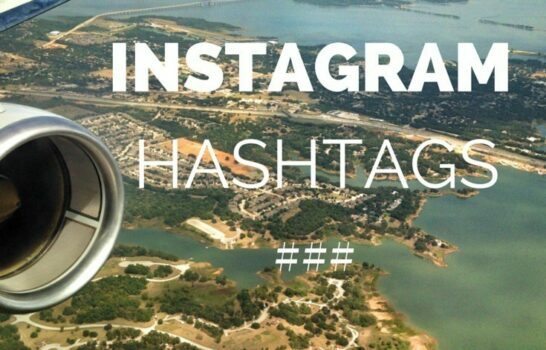 Don’t forget to check my series about flying long haul with kids. looks like a fantastic flight! Looks like a dream to me! About to embark on a 20 hour journey with three kids in sardine class. Rack up those miles! Just wanted to say thanks for a really great review and information. We are looking at a long haul flight to Australia from Europe and Cathay has the best proce so far but was not sure of which seats to take. Given your advice, will likely take 3 in a row in the smaller business class cabin which will give access as you describe above, and my husband and I can sit “next” to each other… The smaller cabin should also mean fewer people to annoy if things go pear shaped with the 2 yo. I’ve been on Cathay with a 2 year old when things have gone pear shaped. Staff is wonderful! As long as you check the plane and verify which business class it will have, you’ll be OK. Three in a row is a great idea in the new business class though if you both want access to your child, maybe consider aisle, window and then the window seat behind your child, if that makes sense? That way you are all in the same aisle and no one has to walk all the way around. 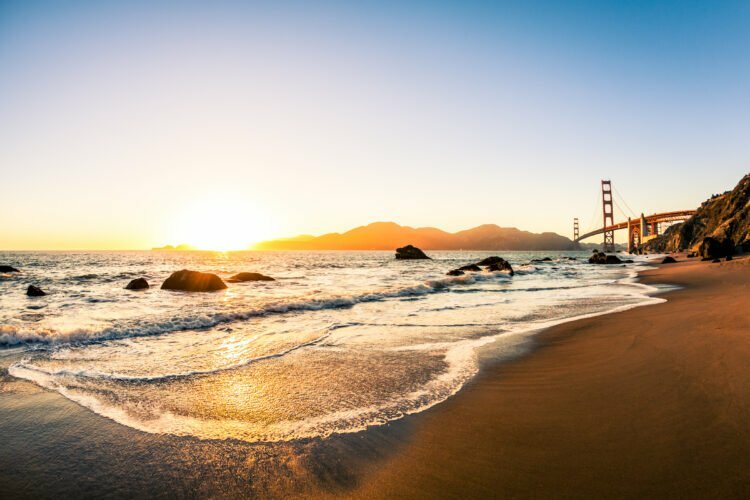 If there are 2 adults flying Cathay business class, which seats would you recommend? The middle seats or the 2 aisle seats? Hi Charles. It depends on the plane. If it’s the old business class that’s in the “v” shape I’d probably take the aisle seats though it really doesn’t matter because you won’t be able to see each other well wherever you sit. Some of the regional business class is side-by-side so seats right next to each other are best. If flying the new business class, I’d take the two middle seats though you’ll have to lean forward to talk to each other since the space is so big… not a terrible problem to have. Enjoy! Cathay Pacific is the way to go in Business Class with kids. Great trip report! Ugh. And the pod is skinny too. I bet your husband had no complaints! Ha. We just flew Air Canada in Business. We flew the Classic Pod-configured 777-300ER (77W), which has a similar configuration to the old Cathay, which is a V (passengers are seated facing the aisle). We also chose seats similar to your strategy and I agree as to how well it works. Daughter in 2A, Husband in 3A behind her, with me across the aisle in 3D. The Air Canada seat design is more open, less private, so that I could see diagonally forward to my daughter and diagonally backward (had to turn my head) to my husband. We had the luxury of guessing that we could switch my daughter and husband around depending on how the visibility worked out. Also the columns are slightly staggered, so that my seat 3D was actually a bit forward of 3A, making a triangle configuration with 2A. This summer I am doing CX, just my daughter and myself, in the New Business Class configuration which is the inverted V. I have never been on CX Business. I am planning to put her in the A seat and myself in the D seat. What is your advice on the row selection? If she is for example in 18A, should I be in 18D or 19D? The seating plan seems staggered so that 18D will actually be forward of 18A and I would have to look back to see her. I would like to avoid having to stand continually to see her, but I understand the CX seats have more privacy walls. I am not too happy about the seat configuration and am considering going on Premium Economy so that I don’t have to keep worrying about losing the seat assignments, whether the aircraft changes, etc. On the other hand, my daughter is 7 now and shouldn’t need my help as often. Hi Sara, I hope you had a wonderful flight on CX. Can you share your experiences on your seat selection by selecting 18A and 19D? . We are a family of 4 and I have also found pictures that kind of look like the window seats are staggered. Thanks in advance!! Really great article! 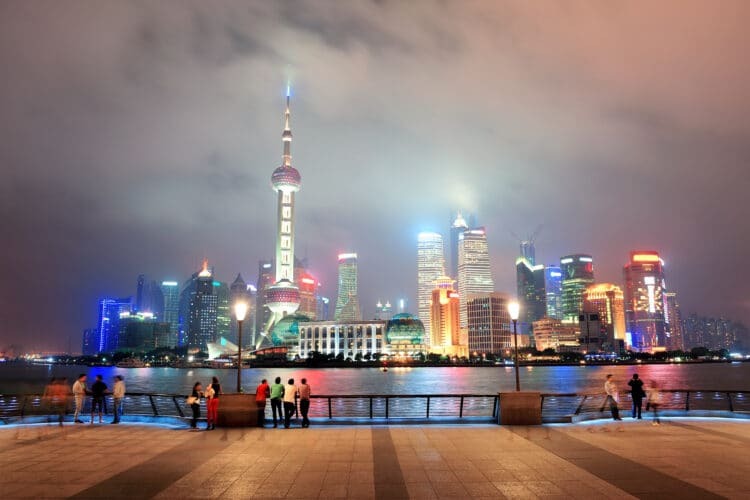 I recently flew the new AA direct flight from Hong Kong to Dallas (half the price of Cathay!). I don't know the plane model but the configuration was exactly as you described. Put my two kids in the middle so they could chat through the partition if they wanted to, and put myself across the aisle from my younger son for easier access. Perfect! I was curious if you've ever flown Cathay's premier economy? Just curious if it's a viable cheaper alternative to business class. I find the economy seats to be really uncomfortable. 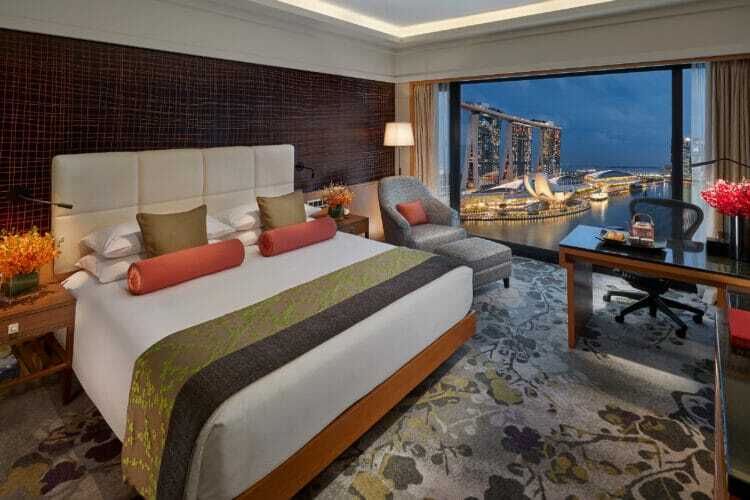 Don't need full lie down, but enough recline and space to actually able to fall asleep. Any thoughts? Oh my I so regret that late reply as I’m just seeing this! I haven’t flown in premium economy yet but I would if business isn’t available. I might be flying to Hong Kong on my own in the fall so am looking at it because it seems to be a good mid-way point between economy and business, though not lie-flat. We are traveling Chicago to Hong Kong on CX new business class in March and my daughter will be just over 2yo. After reading your post, I reserved seat A and the isle seat, but then I took another look at the picture of your daughter and realized she is quite a bit older. Would you still recommend the window seat and the isle seat for a child 2yo? Although the two middle seats don’t seem easier, I’m just worried about “helping” her with her stickers, meals, ipad, etc. from across the isle the entire flight. If you can remember, they aren’t quite as self sufficient at this age! 🙂 Originally we were flying through the night both ways so I wasn’t that concerned, but CX just cancelled our return flight so now we are traveling during the day which will mean a lot more awake time. Ugh!! Thank you for your thoughts! Apologies for the delay in response. It’s a tough call at that age. The line of sight is a little better with the middle seats because you can just lean forward to see what she’s up to. Reaching over the middle divider is a bit challenging because it’s bigger than it looks. But if you needed to get to her or pick up something she dropped, you will have to walk around the galley each time if you’re in the middle seats. I remember being quite tired on a Cathay flight when she was two so I actually slept lying down with her on top of me for a few hours so I didn’t have to deal. If she is a wanderer, you might be best with the aisle seats so you can catch her. I still sort of lean toward aisle seats for you but there are certainly pros and cons for both. Is your husband or someone else flying with you? If so, that’s the easiest… reserve all options! 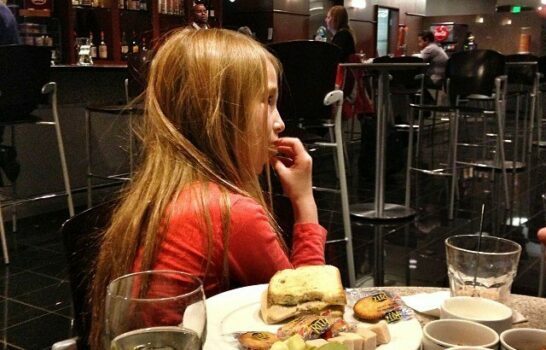 Be sure to request a kids’ meal for her though there is cheese and fruit that passes by for dessert, too. I’m playing Devil’s advocate here & would love to hear your thoughts. I am not judging you – just reflecting on my own personal conscience. Though I’m sure this is informative for a few select folks, for the majority of those flying, even a regular coach seat is beyond reach for a US-Hong Kong haul. 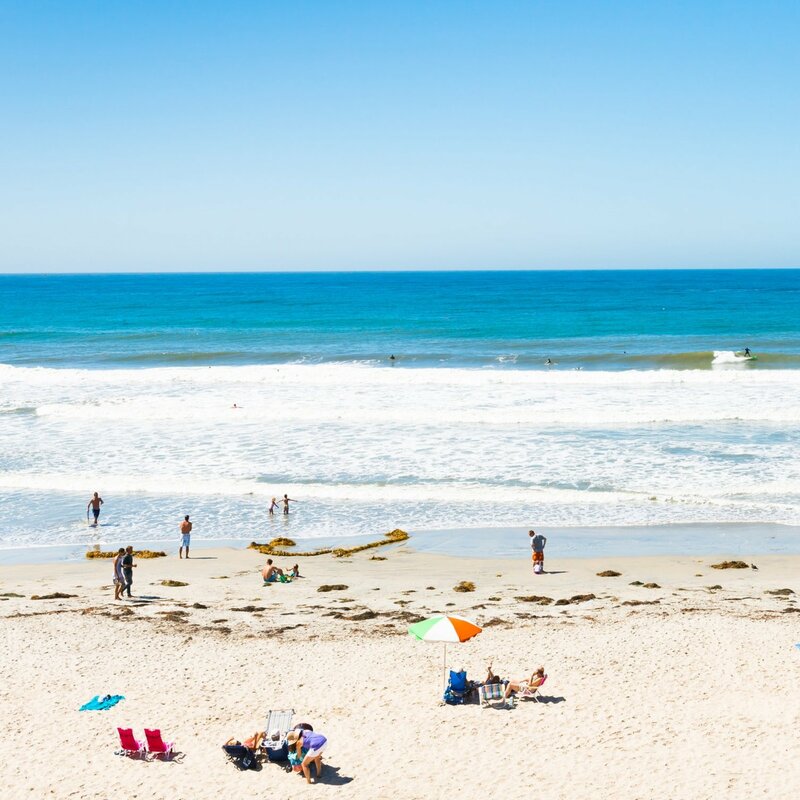 When you are flying with a family of 4, it’s quite hard to stomach spending the equivalent of a one-year teacher salary for comfort & convenience for a 16-hour flight. We’ve done several international trips with our kids, including Australia. While we could technically afford business or 1st class, I just could not fathom spending the equivalent of a Honda Accord for that extra comfort. We also give quite a bit to charity annually & when checking out flight prices, I always think that difference could build a lot of wells in Africa to provide a lot of clean drinking water or greatly support our local children’s hospital. That said, if I can get an upgrade through miles, heck yeah, I will go for it in a heartbeat. But I cannot stomach $6-9k for a single ticket. Wondering if any of this ever crosses your mind? I often buy these tickets with miles, too. But I wrote the post because many, many people who live in Hong Kong purchase these and first class seats outright in cash. Because Cathay was my home airline and I still fly it (in fact I was on board yesterday), I am constantly asked where to sit with kids in business. Cathay is also the preferred airlines of many HK corporations, which often have to fly their families back and forth for expat assignments and short stays (and therefore, foot the bill). I do think about the cost, for sure, but we are a family that lives well below our means so spending it occasionally really doesn’t bother me. I totally get where you’re coming from though! Hi – Thanks for the great post. We are flying to JFK to HKG on Cathay biz with a 20month old in our lap. What seat configuration would you recommend? Thanks in advance! I’d probably take a window seat because that way no one will be next to you. Your partner (if flying with you) could take an middle seat or another window seat. Just be sure you’re on the same aisle. Good review! thank you. 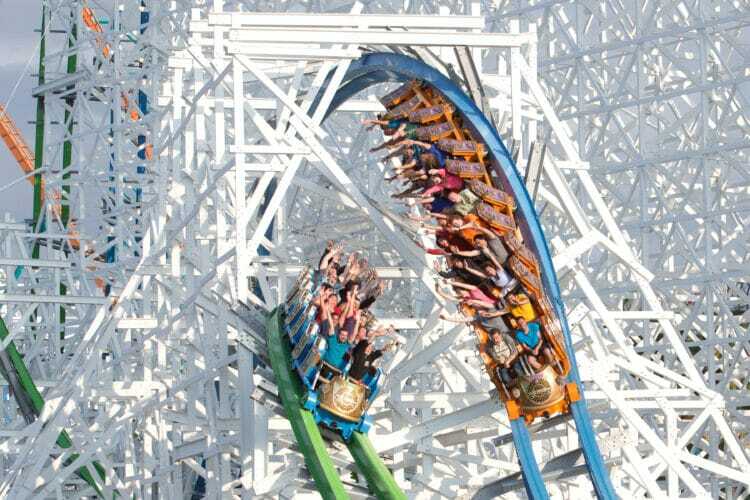 What would be your recommendation of traveling by myself with a 4 year old and a 1 year old (on lap)? Which seats should i pick? I will be going from LAX to HKG. This is the first time that I plan to travel on Business class, it seems will save me more sanity with two kids by myself. Thank you. Apologies for the delay! Yes, it will save your sanity. The flight attendants are lovely. I would take a seat in the middle and one across the aisle in the configuration I mention above. Also, people are willing to switch seats if you find another arrangement is better. My daughter at age 4 was very easy on Cathay because she could operate the touch screen on the TV. I very rarely heard from her. How will CX business class -ORD-HKG-ORD be for 2 of us & our 2 year old toddler? What 3 seats you recommend? Is the seat spacious enough to hold him in our lap for sometime and when we feed him? Does the TV entertainment have baby/kids shows for him? Oh yes, you will have plenty of space. In fact, you may need to hold your child on take-off and landing with a provided seat belt. I used to do that. I might take a window seat and the two middle seats. That way, one of you can have access to your child from both sides. It is a little easier to see kids when in the two middle seats, but it’s just that the access is difficult. The other thing you could do is take a window seat, an aisle seat and another window seat behind your child. That way each parent has access without walking around to the other side through the galley. If you go to Cathay Pacific’s website online you can actually see what is likely to be playing on your flight. 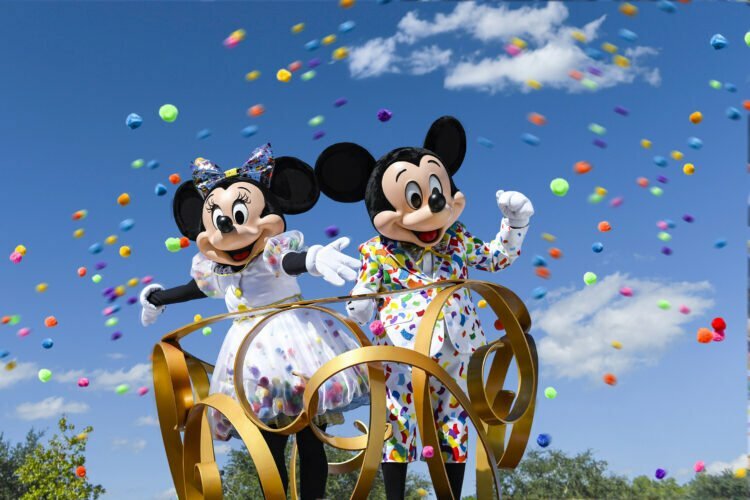 The Disney channel is play-on-demand as well as other programming. We are flying to HK from Toronto later this year with our 22 mo baby. My wife and I will be traveling together. We always fly Air Canada long haul, but were considering Cathay for this flight precisely because of the middle seat configuration as he gets older, which seemed better at first glance. I’m second guessing that opinion after reading your post/comments. We are not buying him a seat. In this case, it seemed to me that the middle would be better as I envisioned we could pass him over to each other during the flight? He is very active and always looks for the one of us that does not have him, and I just thought that taking a window and middle would cause him to keep trying to get across the aisle and calling for one of us throughout the flight! Any thoughts? Thanks again! Hi. Great article. 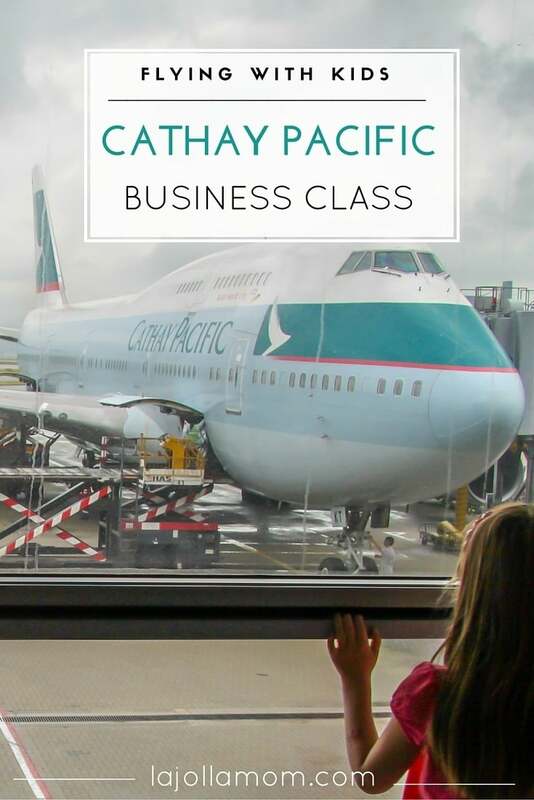 We are a family of four (2 adult and 2 children, 6 and 10 years old) flying LHR-HKG-AKL in Cathay Pacific’s business class. I have booked seats as you recommend in the above article, middle and window seats. And also from watching your you tube video travelling with children in the herringbone style, which it will be from HKG-AKL (A340-400). This is the one that I am most “worried” about. My girl is not too happy about flying and here I have booked 17D, 18A, 18D and 19A, thinking that us adults will be in the D-seats. You describe that you can have a clear view of each other if the child is place slightly behind you. Do you know if this is still the case? Look forward to your reply. I should say that you still have to lean forward a little to see into the child’s seat but you won’t have to get up entirely. We flew in that herringbone configuration when my very shy daughter was 6 and it was fine. The flight attendants on Cathay are excellent with kids in my experience… very soft-spoken and sweet and will turn to you for help if need be. They are phasing out the older herringbone configuration so you may want to check the plane before your flight if it’s the same or not. Plus, kids of that age can get up and walk over to your seat in the event they need something. I pre-order the kids’ meals, too. Your 10 year old won’t need that but they have fun straws and juice boxes a 6-year-old would appreciate. But, as far as I know, I believe it’s still the case as far as that configuration is concerned. I booked CX business class seats for 3 of us ORD-HKG and our child will be almost 2 year during the travel. Do you suggest we bring car seat for him? Put him in car seat and when he falls asleep, remove him from the car seat and lay him down on the seat so he can sleep with the flat bed? Is there a storage for car seat? You will likely be given a child restraint system at that age. It’s a little seat belt that attaches to yours which means the child will sit on your lap during take-off and landing. This never bothered me as I wanted her in sight during these times anyway. Good luck! I have ORD-HKG on CX flight and we all have booked biz seats and one of us is our 2 year old son. He will be 23 months when he flies on this. Now CX website mentions NO CAR SEAT ON business class seats of this plane. Their website says they have Child Restraint Seat (CRS) we can use. I also don’t think you can use the CARES on this seat. So he has 2 options I guess, sit on his own seat with the seat belt or use the CRS CX provides. If we choose CRS, it says it can’t be removed until after the plane lands and that means he can’t take advantage of the lie flat seat that can be turned in to a bed for sleep. I don’t think it should be an issue for him to be able to sit on his own with the flight’s seat belt at almost 2 yrs? We can hold on on our lap during take off and landing. I also have some shorter flights booked on coach seats for all 3 of us on Jet Airways and than return would be on Qatar A350 business class seats. The Car seat although not heavy is big, bulky and very inconvinient to carry around with you at terminals, landing. The CRS restraint Cathay provides, at least when we used it, is just like a seat belt attached to a regular seat belt to keep the child a bit more secure when holding them in your lap. 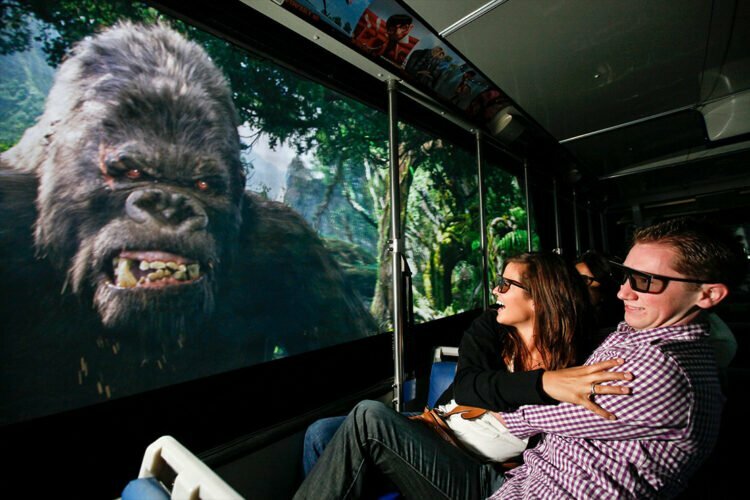 I used it with my daughter for takeoff and landing only (I can not remember if it was required when the seatbelt sign was illuminated mid-flight) and she was in her own seat for the rest of the time watching Disney Channel. The CRS system was not a choice… it was handed to me on board so I used it. It’s simple and not a big deal. It’s removable and there’s no reason why you can’t lie flat with it and make adjustments if necessary. CARES will not work very well on their seats… I had a CARES system. To be honest, CARES is useful for peace of mind only. The kids can slip out of the bottom of it so it doesn’t secure them well in my opinion because it doesn’t have a strap in between the legs like a car seat does. I would check the car seat and use their CRS. Though maybe call and ask what it’s like to use it as things can change! So my fear is my child not getting the chance to sleep on the lie flat seat bed. I have CX biz for 2 of us and my 2 year old, and than HKG- DEL coach and than DOH to ORD business class on Qatar. If I don’t need car seat, I would prefer that since carrying bulky and large car seat at airports is really not convenient and not easy. Please don’t fly with children in business class. All you do is ruin an expensive flight for everyone else. The suggestion of a central seat or two and an aisle seat makes it even worse for those around you, with the constant leaning across or standing in the aisle, with accompanying noise. How do the rest of us get away from the selfish? Perhaps you could write an article on that. Quite frankly, comments like this are myopic. The majority of families traveling in business class are well behaved with parents extra vigilant about their child’s behavior. Of the thousands of flights with families and small kids, you only hear about the corner cases where kids behave badly while the majority are just fine. I would argue that most adults in business class are the the egregious culprits; just look at the litter and mess around the seat after the flight. Just because someone flies First or Business, what gives anyone the right to prevent others to in the same cabin? If families have the means, then they will be allowed to fly. If folks want their own privacy in a cabin without others bothering them, there are plenty of private jet charters. If this post was a provocation on this topic, then I guess here is a response. If so, best to just move along now. 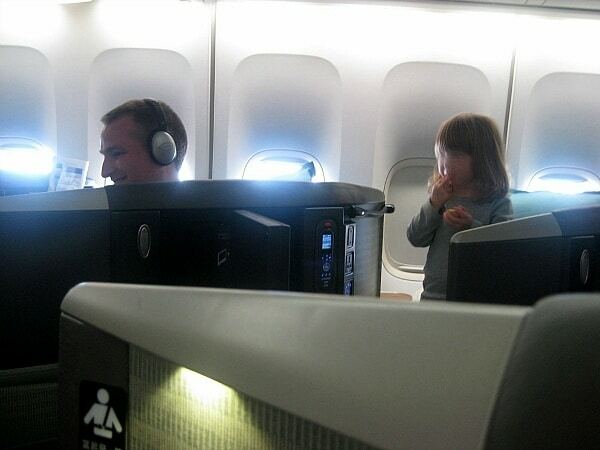 As long as the child is not screaming the place down I haven’t an issue with kids in business class. I flew back in BA 1st from Canada and the three 30 somethings were more of a nuisance then any child I have ever sat next to. And you say ‘you ruin an expensive flight for everyone else’ well, its an expensive thing to take a child on there as well, so wind your neck in. Hi there, the YouTube video you have in this article seems to be marked as private. Would you mind unlocking for viewing? Thank you. It’s Cathay Pacific’s video. They may have taken it down. I’ll find a replacement. Thanks for letting me know! Great piece. We try to fly business/first on longer flights with our son who is only three. He’s very well behaved and generally just falls asleep. The only issue we run into is that there are three of us so we obviously can’t sit all together.